Yealink IP phones and Sennheiser DW Pro wireless headsets – what’s the magic within the EHS36 box? If you’ve ever come across wireless headsets for office phones, you might have noticed that “wireless” in this case actually results in a lot more wires on your desk than using a regular wired headset: At least the charging / base station will need an additional power supply, and maybe also an adapter cable to fit the particular phone’s headset jack, since those base stations are rarely sold in multiple variants, tailored to a specific phone model, unlike the most simple wired headsets. Now there’s one more advantage to wireless than just reducing the chance of accidentally pulling on the cable with an arm (or office chair): You can even leave the desk during calls. Thus it would be great to pickup and hangup calls remotely with a button on the headset – but how should the base station then signal this to the phone? In mobile phones, this kind of button was considered for wired headsets right from the beginning: The de-facto standard means simply shorting the MIC+ line to GND (directly or with a certain resistor value to distinguish between additional functions like track skipping or volume control). However, this was never a requirement for desk phones, so the information about ringing, accepting a call or hanging up usually needs to be transmitted out-of-band: Back in the days of analog phones, the most common approach involved mechanical handset lifters that would actually physically move the handset upwards from the phone, so the hook switch would be released or closed when the user presses the button on the headset, thus accepting the call or hanging up. While this “standard” used to be widely compatible (it just needed to fit the gap underneath the handset), it seemed reasonable for manufacturers of modern ISDN and IP phones to come up with some less hardware-intensive solution – the “Electronic Hook Switch” (EHS). I recently had the chance to play with some Sennheiser DW Pro DECT Headsets at the office – they offer DHSG, MSH and a (proprietary?) Handset Lifter. Our phones are Yealink T46G that do not come with EHS functionality out of the box, but you are supposed to purchase the $40 “EHS36” adapter box by Yealink, which is meant to be compatible with several wireless headset manufacturers (it even comes with a bunch of cables), including Sennheiser (in DHSG mode). The 6P6C (RJ-12) connector on the right goes into the EXT port of the phone through a 1:1 modular cable. For Sennheiser, a Y-Cable is included that connects the 8P8C port on the base with the 8P8C (RJ-45) port on the EHS36 (left) and the 4P4C (RJ-9) analog headset connector on the phone. Basically, Pins 3-6 for analog audio go into the Yealink phone in reverse order, while Pins 1, 2, 7 and 8 (DHSG Control Pins) go into Pins 3-6 (in this order) of the EHS36 8P8C connector. I soldered some 0.1″ pin headers to the modular jack pins on the back of the PCB to capture the signalling between phone and headset base while making some test calls. Due to the pause after each bit, it will not work with standard 8 bit hardware UART though. Here we have SPI with CPOL = 1, CPHA = 0 (“Mode 2”) and a variable bit count, so you probably cannot use most of the hardware implementations available in microcontrollers for this part either, since most of them can only handle fixed 8 bit data chunks. There’s also an LDO voltage regulator on board that generates 3.3V for the logic levels from the phone’s 5V supply. The same “poll” also occurs in between the 1Hz interval, directly before any other command will be sent. 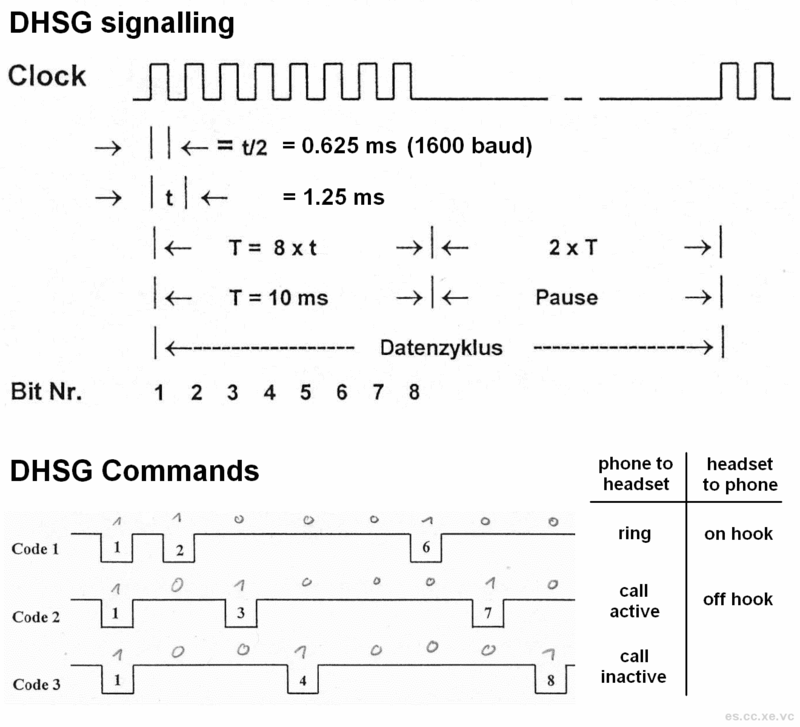 The EHS36 then signals DHSG Code 1 to the headset base, and you can hear the ringing indicator in the earpiece. Now what if you press pickup on the headset? What’s missing? Hanging up by pressing the headset button! A “poll” with first 12 bits MISO high, followed by 19 bits pickup command. This is followed by two “regular poll” commands. The base then receives DHSG Code 3 as an indicator that the call has been terminated. 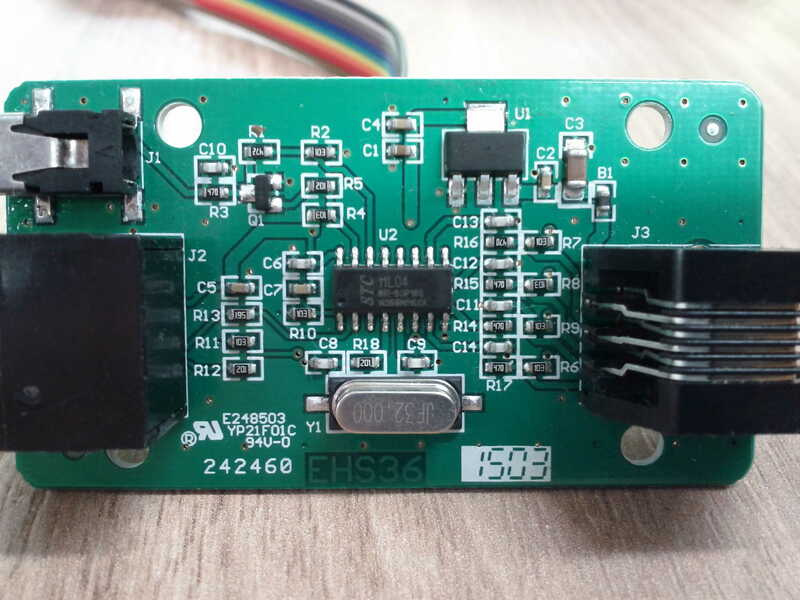 Using the information above, it should be theoretically possible to build your own EHS-adapter for Yealink <-> DHSG, though this would most probably not be cheaper than buying the original one in the small scale. However, you could add some nice features like Busy Light Indication – think of a little LED sign on your desk that shows clearly whether you are available or not? Posted on 31.07.2016 02.08.2016 Categories hardwareTags DHSG, EHS36, Sennheiser DW Pro, teardown, wireless headset, Yealink4 Comments on Yealink IP phones and Sennheiser DW Pro wireless headsets – what’s the magic within the EHS36 box?